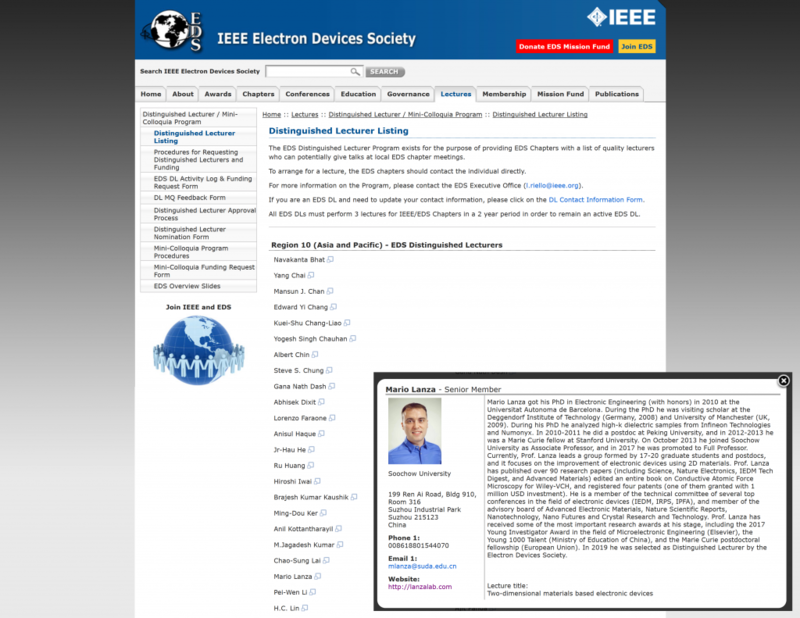 On February 12th of 2019, Prof. Mario Lanza, full Professor at the Institute of Functional Nano & Soft Materials of Soochow University, has been selected as Distinguished Lecturer by the Electron Devices Society (EDS) of the USA, which belongs to the prestigious Institute of Electrical and Electronic Engineers (IEEE). Prof. Lanza received this distinction for extraordinary contributions in the field of “Two-dimensional materials based electronic devices”. The high selectivity of this distinction can be seen by the fact that in Mainland China there are only four scientists who received it, and the other three are: Prof. Ru Huang (Peking University, Academician), Prof. Ming Liu (Chinese Academy of Sciences, Academician), and Prof. Tian-Lin Ren (Tsinghua University, Chang Jiang Scholar). The complete list can be found here: https://eds.ieee.org/lectures/distinguished-lecturer-listing.html. Congratulations to Prof. Mario Lanza for this achievement!